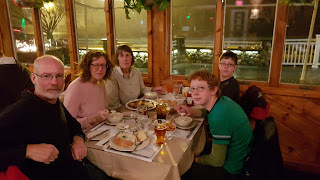 Today we packed up from the place we were staying in, and went to the car rental place on the subway, picked up the car and headed off to Sourh Yarmouth. We then drove to Harvard, and did not get out of the car as it was raining, but we did look around some of the outside of Harvard, a school which I would be happy going to. We then headed south towards Cape Cod, and got off the motorway at Braintree, so we could look at the houses along the coast. In Scituate, we saw some historical places including the Lawson Tower, which looked old. We stopped at a Dunkin Donuts in Plymouth, where the earliest settlers landed and walked onto the Plymouth rock. We drove past the Plymouth Rock, and then headed off to our accommodation in South Yarmouth. For dinner we went out to a resturant called Captain Parkers, which had awesome Clam Chowder, which I could not finish. We went back to the accommodation, and went in the pool before going to bed.